The Hutchinson Grain Pump is a continuous grain loop conveying system (chain conveyor), that incorporates the functions of many of the traditional grain systems that have been in the market place for a long time. The grain loop can incorporate many storage bin units and provide easy in-load and out-load to trucks or wagons, moving grain vertically and horizontally with ease. 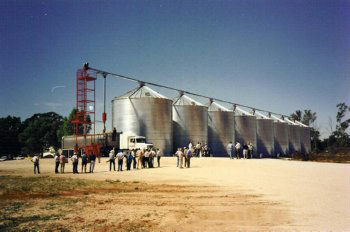 Turning grain within one bin or from one bin to another bin. Easy incorporation of “off-line” functions such as drying, cleaning, rolling, grinding or other processing. Ability to incorporate many bins into the system. And, all with push button automation. The Hutchinson loop lets you move product with gentle efficiency and at high capacities, requiring less horsepower and causing less damage. The unique U.H.M.W. (Ultra High Molecular Weight) paddle keeps grain flowing gently and evenly from inlet to discharge, taking the place of traditional auger flighting. The closed loop design offers the versatility to create a complete load-in/load-out system with re-circulation capabilities. It can be installed underneath a row of bins or in an existing in-line system. An entire family of attachments and options enable the system to accommodate any bin combination. The simplicity of the Hutchinson design, with four 90° corners completing a rectangular loop and driven by only one or two motors, makes the choice between conventional systems and this one a very easy one. Round Ultra High Molecular Weight (U.H.M.W.) plastic paddles are spaced every 13 inches and are notched to facilitate chain sprockets in each corner. Owners have found a reduction in damage when compared to traditional conveying systems and the durability of the paddles is unbeatable. The closed-loop design allows you push-button convenience with the effectiveness of a bucket system with savings of up to 40%. 10" Pajar Farms Grain Loop, Fort St. John B.C.